Grammy's Attic: Candy or Fish? Love your kitty story. Cute card too, and great colouring. OMGosh! This really did make me LOL! It is too cute and what a fun, fun sentiment! Fantastic coloring, too. Thanks for joining us at Fitztown Challenge Blog. Hope to see you again and good luck! This is such a fun image! I love Halloween- just not what comes next.....snow, snow and more snow..... Love the frame die too- so pretty! 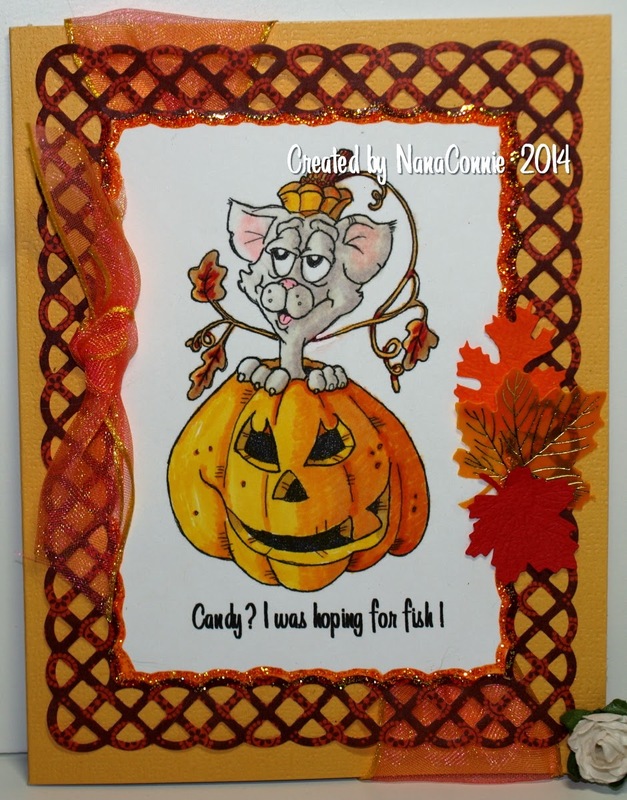 fabulous fall card. Love the ribbon treatment and the accent leaves! Thank you for playing along with us at DRS Designs. This is a totally adorable card. Thanks for joining the Craft-Dee BowZ challenge. Thanks for joining our Fall Challenge this week at Die Cuttin’ Divas. REally cute!! Love the frame die.. that is gorgeous! Love your ribbon too and the edge around the image!! This is fantastic! Thanks so much for playing along with us at Open-Minded Crafting Fun Challenges!!! Good Luck! I hope we see you again!! Love this image and love your card! Another cutie!!! Love the frame you used to highlight that cute image. Really cute card and cat. I like the layout of the card and colors. He/she is so cute in the pumpkin. thanks for playing along with us at Fitztown for our animal challenge. What a sweet card with a fun sentiment. Lovely autumnal colors! Hi conne, love how you Colored this image from QKR, thanks for sharing this wonderful make with us at Open Minded Crafting Fun Challenge, and good luck. LOVE that kitty! Great coloring, and the background & frame complement the image perfectly! That greeting is wonderful, too. Love the conversation you recounted that you had with your cats. I can totally relate--we've got 3 house cats ourselves! Thanks so much for sharing! Beautiful coloring and that edge is great, thanks for joining us for our pumpkin challenge. What a sweet card . . . and a super cute image. It's just perfect for our "any holiday" challenge over at HIMCR this week. Thanks so much for joining us!!! Good Luck!!! I totally adore this sentiment with this image! So very cuuuuute! Thanks for joining our fortnightly challenge here at Open Minded Crafting Fun Challenge. Hope you will join us next time co-owner Crafting Vicky. Just perfect! I keep smiling here for the image and sentiment. :) I love this card with rich colours and that frame is gorgeous! Thanks for joining Open-Minded Crafting Fun NanaConnie, Good Luck! Hope to see you soon again.